PHILADELPHIA — Comcast today announced the launch of Xfinity Flex, a new service that provides Xfinity Internet-only customers the ability to use their television and voice control to manage all of the connected devices in their home, and enjoy many of their favorite entertainment experiences on the big screen. 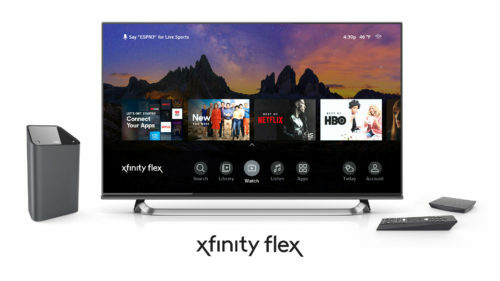 Available to all Xfinity Internet customers across the country starting next week, the Xfinity Flex service is packaged with an Internet-connected, 4K HDR streaming TV device which comes with Comcast’s award-winning voice remote, one integrated guide for accessing popular streaming video and music choices, as well as Comcast’s home WiFi, mobile, security, and automation services. Xfinity Flex comes with more than 10,000 free online movies and TV shows—including live streaming TV—from ESPN3, Xumo, Pluto, Tubi TV, Cheddar, YouTube, and more. The Xfinity Flex box features an integrated guide and voice control, enabling customers to easily browse and access programming across apps like Netflix, Amazon Prime Video, HBO, and Showtime, rent and purchase movies and shows from the digital store, access their digital lockers across platforms by pairing their account with Movies Anywhere, or listen to music from Pandora, iHeartRadio, and XITE. And soon, Xfinity Flex customers will be able to easily upgrade to the full Xfinity X1 cable service right from the guide, which offers hundreds of live channels, tens of thousands of on demand titles, and a cloud DVR. As more connected devices, streaming choices, and smart home services come online, Xfinity Flex will provide customers with an easy way to better manage, control and enjoy the connected home as it continues to grow. With Xfinity X1, Comcast has taken the complexity out of TV and the digital home for Xfinity TV customers by uniting traditional and streaming entertainment, high-speed data, and home automation on the TV. Xfinity Flex gives Xfinity Internet customers some of these same features, enabling them to easily access their entertainment, find their WiFi password, see what devices are connected to their network, set parental controls, and even pause WiFi access on their home network. They also can use voice control to access their camera feeds, arm or disarm their home security system and find their Xfinity Mobile phone—all on the TV.